In an earlier essay this year, I used the useful maps prepared by Professor Ole Humlum of www.climate4you to ponder about how hot it actually was in Australia last year. I did so because of claims that the year was the hottest ever, as it was said to be for the world. When I wrote the piece I did not have access to the summary for the whole year, but I now have it, and it is displayed below. These data are from the Goddard Institute of Space Studies, which is part of NASA, and they show the relative change between the average temperature for 2016 and the average for the preceding decade. I’ll deal with data questions later in the essay. But for now, you can eyeball the map with a glance at the colour chart and infer that there wasn’t much change in general, and nowhere (perhaps western Alaska excepted) was the change abrupt. Indeed, for a decent chunk of the globe there was no measurable change at all. To be fair, I think there is rather more green than blue, and that would accord with the actual data and estimates, which do show a small increase. Very generally, eastern Siberia through Alaska (especially), Canada and the United States had a warmer year than the ten-year average, while Labrador and northern Quebec, central South America, southern Siberia and southern Western Australia all had a rather colder year. The oceans were generally cooler with the exception of the eastern Pacific, undergoing an el Nino episode. Since my initial interest was in Australia, we can see that, very generally again, from the Ord River in northern Western Australia and going east and then south, right down to Tasmania, the coastal and contiguous inland areas were a bit warmer, while it was colder from Adelaide west. So any ‘average’ for Australia ignores two different and consistent temperature patterns. Why did I use the GISS data? For two reasons. First, it is the one Ole Humlum used, and he provided the mapping, which is what I wanted. Second, the GISS data are the ones that have been most affected by ‘adjustments’ of various kinds, so I was using a dataset most unlikely to support my own general argument, which is that claims of increased temperature based on these data have to be put into some sort of context. Interested readers can compare the two maps in the two essays. I probably should say again that the notion of an average global temperature is just that, a notion, a statistical construct, a number to serve other ends — in this case to provide a measurement baseline for the AGW theory that the world is heating up because of the activity of human beings in burning fossil fuels, making cement, and so on. What seems more important to me is the great variation around the world. During 2016 I read a few pieces referring to Alaska’s abnormally warm year, and that was news because we normally think of Alaska as a cold place, with polar bears, glaciers that drop into the sea, and roads that were a real problem to construct during the second world war. I don’t remember the ABC telling me of Perth’s unusually cool year, though I may have missed it. The GISS data, or GISTEMP, are worth some consideration, and you can read about their history here. My summary is that until the late 1970s there really weren’t global temperatures of any consequence. Most of what was said to be known, was known about the northern hemisphere. In 1981 James Hansen, then the head of the Goddard Institute, was the first, with his colleagues, to try to systematically estimate global temperatures, and ‘global mean trends’, by combining northern hemisphere data with what southern hemisphere data there were. What follows comes from the history set out in the link above. The methodology used then was relatively simple: Stations were grouped into 80 equal area boxes, the various anomaly series in a box were combined into a single anomaly series; these then were averaged across each of eight latitude belts. The global mean was estimated from an area weighing of the latitudinal means. From this beginning, estimates of global mean surface temperatures by scientists at GISS eventually morphed into the GISTEMP analysis that is available today. Overt the years the estimates have been changed again and again, for two reasons. The first, the methodology changed, and second more data came to be available and was used. So 80 grid boxes, for example, became 8000. But here are some changes that rather make one’s eyebrows rise. Surface air temperature anomalies above the ocean were estimated using sea surface temperatures from ships and buoys starting in 1995 as documented in Hansen et al. (1996). Starting in the 1990s, the methodology took into account documented non-climatic biases in the raw data (e.g. station moves) and eliminated or corrected unrealistic outliers (Hansen et al., 1999). Areas with missing data were filled in — using means over large zonal bands — rather than restricting the averaging to areas with a defined temperature change (Hansen et al., 1999). I guess that one can make an estimate for the temperature of the air above the surface of the sea by using the temperatures measured by engine intakes and buckets, and from the buoys. There’s got to be error there, and the summary doesn’t deal with it. As readers will know, my view is that, given the number of ships, the number of buoys, the great expanse of ocean where there are neither ships not buoys, not to mention the fact that we are discussing estimates here, not actual measurements, one cannot have much confidence in the outcome, unless it is used as a most general pointer to change. And I don’t like eliminating unrealistic outliers, for reasons discussed in the past, let alone ‘correcting’ them (oh dear). Finally, I don’t like providing data where there aren’t any, by using ‘means over large zonal bands’. All you are doing is providing more dodgy and uncertain data. Those interested can read on further in the GISTEMP history, and see that there have been 13 different sources of land and sea temperature data between 1981 and 2016, to which the author(s) of the document comment, So although the specific numbers and the uncertainty associated with them have changed over the years, what is remarkable is that the basic picture they paint of the temperature changes over time is robust as can be seen in the following figures. To which I would respond that as long as all one wants to do is to argue that the world has warmed a little over time, the data will do. But they would do that even if the outliers were kept and there were no adjustments or filling in of empty cells with zonal means. What the data have been used for, of course, is the insistence that the world is warming quickly and that the villains are human beings. I don’t buy either assertion without a great deal of qualification. Just for interest, I had a look around the climate blogosphere to see whether or not Ole Humlum and his website were the subject of sustained critique from anyone. I couldn’t find much. SkepticalScience is the obvious candidate, and indeed there are two attacks on Professor Humlum there, but these focus on statements in his published papers, which I do not think are especially important in this context, and won’t go into here. But so far as I can see, his use of the official data passes the criticism test. And what is the difference between the data used by BoM, and the GISS data? I don’t know, and for those who wonder why I didn’t use BoM data I point to the fifth paragraph above. End note: Some time ago Russ Swan wrote to me to alert me to his new website on issues in climate change. I said I would alert readers to this website when he published more. He has done so, and I generally approve of his style and content, which is temperate and sensible. I do not know Mr Swan personally. Those interested can read about his views here. 1 – IPCC. Its charter only directs it to report on the human influence on climate. The text of its reports is altered to agree with what government representatives agree should be said in the Summary for (by?) Policymakers. The organisation is science dancing to the tune of its political and UN masters. 2 – The CRU. Poor data coverage prior to 1950 (and the same can be said for any temperature dataset). The CRU creates its dataset after the data has been “homogenised” for station moves, instrument changes and so on. Taking that homogenisation as correct for every station is more an act of faith than evidence-based science. 3 – The CSIRO. Been on the gravy train for years and it’s been a good source of income for it. When at least two different people (to my knowledge, maybe there’s even more) asked for its evidence that CO2 causes significant warming it’s provided nothing of substance, usually just a general wave in the direct of IPCC reports or in one case to a paper that the person requesting saw was wrong within 10 minutes because he had a solid background in the physics of heat transfer by radiation. You have rewritten these words in a rather biased form. Data before 1950, is only RELATIVELY poor. It is not absolutely poor. Within limits we can work with CET (Central England) and even First Fleet data from 200 years ago. Why not say the data is relatively poor before 1979, before we had satellites? Why not say the data before 2010 was relatively poor because we did not have 30 years of satellite data. You use the data you have, and such quips are merely opportunist. Such quips are also illogical because if pre-1950 data is poor in a relevant sense, then there is no basis for claims that GHG’s have had no impact. When you look at the data as it is, this any no impact claim is disproven. Your comments re CSIRO are wrong, slanderous, and partisan. The physics of heat transfer by radiation, for climate change purposes, is at the degree level. Trapped heat is distributed within the Earth depending on the areas of land, air and water according to the specific heats of each. The resulting temperature rise depends on the amount of mixing within air and water, and second effects such as melting, evaporation and precipitation. Is it the case that you have just copied comments from a denialist website? I repeat. The focus of the IPCC is one thing only, human induced climate change, which was assumed from the outset or its charter would not be written this way. As for global temperatures, would you think it okay to measure the height of less than 50% of a group of people and announce the average for the entire group in a form to three decimal places? That’s what happened with southern hemisphere temperatures until about 1960. In the NH the coverage prior to 1950 was over 50% (at least it was after the 1880s of thereabouts) but it still fell well short of of 100%. As you go back in time the coverage was even less. The CRU’s web page give sthis coverage information. I stand by my comments about the CSIRO. The evidence is (a) the funding it received for climate related research, especially modelling and (b) the fact that one of the people asking for evidence from the CSIRO was Senator Malcolm Roberts and he says that nothing of substance was forthcoming, only references to IPCC material. ( Others have shown that sometimes the CSIRO refers to IPCC material that CSIRO people wrote, somehow trying to pretend that passing it through the IPCC imbues it with credibility.) If you have some credible evidence from the CSIRO that CO2 poses a significant threat then I’d sure like see it. Yes, with proper techniques and within confidence limits – this is possible. It is called “statistical sampling” and there are standards for sample size etc. If you measure the grain yield from several samples from a field – you can estimate the yield for the whole field. It is quite appropriate for the CSIRO to refer to IPCC materials in response to queries. The credible evidence that CO2 poses a significant threat is multi-sourced from august scientific institutions and is based on present GHG trends either levelling off, falling insignificantly, or increasing. Despite all the hot air – Australia’s CO2 emissions increased slightly last year – when most people would have hoped for a fall. Hey Chris. I asked Russ why these sources were these sources could not be used. In short…. Russ ‘believes’ the science is corrupted, and they don’t provide ‘balance’. The generally accepted weighting is based on the cosine of the degrees of latitude because this neatly takes care of the narrowing distance between lines of longitude as we approach the poles. FWIW off the top of my head the surface area from the polar circles to the pole is about 10%. On this basis the image should be interpreted as follows – mainly very pale green in the tropics indicates slight warming over 50% of Earth, widespread cooling in 30 to 60 degrees but not everywhere, warming north of the Bering Strait in an area that’s maybe 5% of the Earth’s surface. This all probably balances out to an average of slight warming. Thanks, John. I am aware of the point you make, but my language could have been better. Don’t your language is fine. Let it rip. Who are you calling ‘fat fingers’? The IPCC does not do any original research. What it purports to do is review the relevant peer-reviewed literature. After the Climategate episode the UN & its IPCC commissioned a review of IPCC’s processes and procedures. That review was done by the InterAcademy Council using input from IPCC participants. The review (available online) documented the following problems viz. Political interference, bias, lack of transparency in the selection of personnel, lack of transparency in the selection of technical material for analysis, use of reference materials which had not been crically assessed, failure to consider the full range of valid scientific views, vague statements not supported by evidence, failure to respond appropriately to critical review comments and a lack of any policy to preclude conflicts of interest (e.g. lead authors reviewing their own work to the exclusion of other competing publications). In other words a thoroughly UNscientific modus operandi. Whether these problems have been effectively remedied is not clear. energy companies”? This is code for fossil fuel capitalists. Why did you not mention that there was only a general statement about political interference – no case of such? Why did you not mention that the Review was dated 2010 and related to AR4 (and AR3)? Why did you not mention that the Review concluded “The overall structure of the IPCC assessment process appears to be sound”? successful overall and has served society well.”? Why did you not mention that your accusations of failure were extremely overblown as the Review raised some technical failures only in dealing with the Western Himalayan glaciers (incl. Karakoram Anomaly) plus when following uncertainty guidance which had “shortcomings”? Why did you not mention that the Review was considered at several subsequent IPCC plenaries? Surely any bias or conflict from “for-profit energy companies” would damage IPCC processes. So why did the Review seek to load the IPCC up with representatives from outside the Climate Community? Are you claiming (or at least inferring?) that adding the “dodgy” SST data into the mix has allowed them to claim a faster warming rate than had they just stuck with land measurements? I get really tired of this. You can work out the answer for yourself. Thanks Bryan, that could be your most insightful contribution since: “However, I invite you to consider the situation in which the data used to calculate the confidence intervals are themselves subject to uncertainty?”. Too often I’ve gone down a long technical discussion in these parts only to have Don eventually finish it with “we’re arguing at crossed-purposes, I never said that” (paraphrased). So I’d prefer an answer from Don if that’s OK with you (actually, regardless of whether it’s OK with you). Oh, and I almost always tire of Nanna Drongo’s responses, so I rarely read them; you might consider doing the same with correspondents you find tiresome. You may even find that less tiresome than reaching for mouse and keyboard to post one-liners like the above. It might save us all some time. JimboR The water temperature in Port Phillip Bay is currently 20 degrees Yesterday it was also 20 degrees. Tomorrow it will almost certainly be 20 degrees again because it is a very large stable body of water. What can we infer about the air temperature above Port Phillip Bay on those three days? I don’t ‘claim’ things. I argue and question and reply. The answer to your question is ‘No’. Read it again, and you’ll see that I was saying only that you don’t need all these adjustments, averaging, correcting outliers and using means from elsewhere if all you want to say is that the world is getting warmer. The data we have, poor though it is, generally supports such a proposition. But if you want to say that the warming has increased by 0.X per cent over Y period, then you do need to do all this. I don’t see any need to do it, but then I’m sceptical..
Don, thanks for the clarification. I think you have claimed that major well-respected scientific organisations have used their data processing techniques to deliberately inject bias into the warming trends in order to please their political masters of the day. So forgive me for reading that “endeavour” (there you go, I’ve found a more PC term than “conspiracy” for you) into your text that I quoted above. At any rate, I’m glad to hear you don’t claim the addition of the SST data into the global mix is part of that “endeavour”, and by declaring that early you’ve saved us from heading down a major rat-hole. Any specific thoughts on that 1999 Hansen et al paper quoted above, or do you think your “I don’t see any need to do it” covers it sufficiently? Jimbo, I haven’t ‘claimed’ such a thing. What I’ve said is that it is natural for government agencies to do things that are consistent with what their political masters want. I have also written, from experience, that a new government initiative gets colonised by ‘believers’ in the virtue of that initiative. Such officials often want to push their masters further along the virtue route. I’ve seen it happen. I have also written that government agencies develop a culture which attracts ‘believers’ and turns away dissidents. You can see such cultures in the ABC, the various MSM, in some universities and, I would say, in the BoM and the climate bits of the CSIRO. Now to your question. Yes, I have read Hansen, a long time ago, but I re-read it at your suggestion. I still don’t see any need to do what they did, other than intellectual interest. Of course his general point was almost at once overturned by a decade or more where temperature didn’t rise much but CO2 did. I’m not going to go through the paper page-by-page. As far as I can see he used Reynolds and Smith for SST, but they were dealing with the early 1990s, and as they point out several times, the data are scanty for much of the ocean. Where Hansen got SST from 1950 and earlier is not clear to me, but since I have said several times that those data aren’t worth the processing and adjustment they have received, I’m not going any further. Perhaps you could set out for the benefit of readers your own view about all this, explaining in particular why you would do all this in the first place, and how you would overcome the obvious methodological objections to what has been done. True to varying extents – “You can see such cultures in the ABC, the various MSM, in some universities and, I would say, in the BoM and the climate bits of the CSIRO”. But this has always applied. What about even worse cases within Windschuttle’s Quadrant, Rightwing “News Weekly”, News Limited publications generally, Donal Trump’s praetorian guard, EXXONMobil, Shell, BP and fossil fuel lobbyists of every stripe. Andrew Wilkie exposed a fake culture within ONA. Wikileaks seems to have had some success as well. Even some academics have been exposed for their fake culture or agendas against union superannuation schemes. However the objective data and the corroborated, cross-examined, science are clear – independently of all this opportunist noise. The observed warming trend due to GHG is the issue that rises above all this. Yes, Chris, there are cases everywhere. Why you think they’re worse cases i don’t know, and you haven’t explained. ‘The observed warming trend due to GHG is the issue that rises above all this.’ How much of the observed warming trend (over what period) is due to GHG? Who says so, and on what basis? When you think I’ve made a ‘claim’, go back and read carefully what I’ve written. It is boring having to do verbal ping-pong. On that we can agree! I must admit, I do find you hard to understand sometimes. Did you claim “BoM’s finding a warming trend by choosing the sites that report it, and homogenising past data likewise.”? You certainly wrote that phrase in a sentence. Are you now saying you never claimed they did that, you simply threw it out there as something they might do, and if they did do it, you wouldn’t be surprised? If so, that’s misleading at best. Have you ever put this to a statistician working on climate change. William Briggs hs certainly demolished the notion that these adjusted data mean anything much. Go to his website. From the map above we can see that at least 60% of OZ shows cooling or no change compared to the last 10 years. So where is the impact from co2 over the last 10 years? Is this the same as the supposed “pause” or “hiatus”? The warming trend, of concern, is a global trend. The best study that tells us what the temp of OZ has been like over the last 6,500 years of the Holocene is the Calvo et al study. And other studies from our region like NZ and Antarctica plus central OZ support the Calvo results. Southern Oz has been cooling over the last 6,500 years and the central OZ study ( Miller et al) finds similar cooling as well. Jimbo, no more. Read what I wrote above again. You use the word ‘claim’, I do not. Yes and it’s also a bit repetitive when you dog whistle RWNJs then feign inocense when you get pulled up by Jimbo and CW. You make a universal claim that ALL institutions are subject to political influence, then with ZERO evidence then claim that the BoM and the climate bit in the CSIRO are especially suspect. The BoM is my favourite Quango. Tell me BoM that you are mine. David, yore speling is atrosus. The text “feign inocense” should be “fain inocense”. At leest you got “inocense” corect. Yore english tescher clearley faled you. I’m not surprised, but as so often with you, you get the facts wrong. It is a government agency responsible to a Minister, not a quango (quasi non-governmentl organisation). The rest of your comment is indecipherable and (if I understand it at all) nonsensical. Right wing nut job (RWNJ). Does that make sense now? Don, really? You’ve not exactly been a beacon of clarity on this one. Here’s what we know…. At the time of writing #2 I thought it was entirely uncontroversial. I believed it to be a genuine reflection of your position. You don’t agree, and since only you know your position, you are of course the final arbiter on such matters. After much verbal ping-pong it seems to have come down to my use of the word ‘claim’ (“to assert as a fact” according to my dictionary). So you wrote #1 but you don’t assert it as a fact. What does that make it? Fiction? Hyperbole? Humour? Sarcasm? Hypothetical example? Maybe, but given the context none of those seem a comfortable fit. David’s explanation (the one you find indecipherable and nonsensical) is currently the best one we have. Chris said the global temp trend is what we should be concerned about . I’ve checked the York Uni tool again and compared the 1910 to 1945 trend to the 1975 to 2017.2 trend. Averaging 5 of the data bases for both periods I’ve found that the later trend is 0.32 c per century warmer than the earlier trend. BTW I left out HAD 4 and used HAD 4 krig. Also used only Karl global and used an average of the rest. That doesn’t seem much of an increase to be worried about and I wonder how much of that could be due to the higher UHIE? A number of scientists consider that the UHIE is much higher than the 0.1c allowed for by NASA Giss. Also clouds are very hard to model and the solar residual effect may be higher as the Russian scientists believe. But please check my numbers, I could be wrong. Thanks for that assurance Nev. Makes me feel all warm and fuzzy. Using all of the global data sets produces essentially the same – an acceleration of .35 per century – over land and surface ocean. The actual rate is around 1.8C per century and this looks like increasing to over 2C century during the next generation, and so on. This is not a relevant indicator of global warming as the deep ocean is absorbing heat. The earth’s crust is absorbing heat and the atmosphere up through the troposhere is also absorbing heat. The remaining global land ocean impact is only a net effect after some heat has been absorbed through increased evaporation and ice melt. If you run the same exercise using data above the land-ocean surface, you get a different picture although this data is only available from 1979. The amount of extra heat being trapped in the Earth’s system as a whole is equivalent to a temperature change over 7C per century. This is reflected in the observed cooling trend at top of stratosphere since 1979. Chris I think I’ll go along with Lewis and Curry and all the other recent climate sensitivity studies. And they are WAY below what you’re guessing about. IOW your guesses are WAY out of the ballpark. Check out the 1860 to 1880 warming trend and you’ll find that the difference is even less again. But of course you can only use Had 4 and Had 4 Krig. I’ve linked before to all the recent ECS studies and the average is between 1 to 1.5 c, so nothing like what you’re saying. OH and I’m sure they’ve taken everything into account that you’ve thrown into the mix as well. OH and the SAT temp trends are 1.23 c and 1.35 c per century so that doesn’t help your inflated case either. And both SAT trends since about 1998 are way under the full trend. And that’s not a cherry pick either, but just follows on the IPCC choice in AR 5 2013. Please don’t make stuff up. Making false accusations of making stuff up will not get you very far. Don’t be a Drongo. At around 35 km high it is over 5C. At around 30C it is just under 5C. Anyone can do this exercise. This is the real impact of GHGs and how it registers in terrestrial measurements depends on the balance between land and ocean heat capacities and resulting energy balance after some heat has been absorbed in increased evaporation and ice melt. These are not thrown into the mix – but necessary features of the system which if not taken into account produce false results. How do you explain the cooling of over 7C and 5C. What happens if this continues? Chris, have you considered that the earth is naturally hot? The flow of heat from Earth’s interior to the surface is estimated at 47 terawatts (TW) and comes from two main sources in roughly equal amounts: the radiogenic heat produced by the radioactive decay of isotopes in the mantle and crust, and the primordial heat left over from the formation of the Earth. In short, a pot of boiling water is not affected by the temperature of the kitchen. I saw this statement and wondered who wrote it. And it was you Bryan. Why am I not surprised? Surely there can be no better argument for the Greens “free pill testing” than your posts to this site. I am not aware of your source for 47 terrawatts, but it is plausible. A pot of boiling water will affect the temperature of the kitchen. GHGs create a stove in the atmosphere. That encapsulates your problem, David. No attention span is too short for you. Who knows, but for the grace of the UQ Physics Department, I too may have turned out like Bryan. So why is it so cold in winter Bryan? Compare your 47 TW with the 170,000 TW arriving from the sun, about half of which gets absorbed by the planet (land and oceans). If I’ve done the ratios correctly, your kitchen analogy would be closer to having a pot of water sitting on top of tea candle, with a 57kW radiator shining down on top of it. … but the water will eventually boil, won’t it, with or without the radiator. So if the sun is so important, what’s with AGW? N.o matter how much you jump up and down, Jim, the world will continue to turn. How many issues were the ‘cri de coeur’ a hundred ears ago? Remember any? Probably not without a good lid on it. Otherwise the heat will radiate away long before it gets anywhere near boiling. And that’s what AGM is all about… what impact we’re having on that radiation balance. Hold your hand over a candle, Jim, and feel how quickly the heat radiates away. When you “write from experience, that such and such is so ..” is that the same as claiming? So what are you going to do? Try and impress us with your “ability” to walk back a statement with some wholly unconvincing hand waving. This is an unfair characterisation and, as noted earlier, smacks of conspiracy theory. It also represents shooting the messenger. Having worked in a Research and Data Analysis role in Australian Public Service for years, I know for a fact that this is impossible, although top managers may report facts selectively. If data is (so called) homogenised there will be scientific reasons for it. There may be scientific reasons why such processes create worse problems, but throw-away campaign quips are not this. It would be fairer of me to state that my complaints with the BoM and CSIRO relate to the ‘climate change’ work they do, and what comes from that. Other parts of the organisation may well do excellent work, and I have seen no reason to suggest otherwise. And I would agree with you that top managers can (and do) put a spin on the work their departments and agencies do. Having said all that, I do not think that the statements made about hottest weather and likely future risks made by BoM and CSIRO, whoever says them, are well supported by data, and there is abundant evidence, gathered by Jennifer Marohasy and others, that must worry anyone who is not an out-and-out believer, that adjustments have been made that don’t seem to have been caused by station changes or any other plausible cause. What is more, BoM (in this case) refuses to explain in detail. Dr Marohsay has published a (n=2) study titled “Modelling Australian and Global Temperatures: What’s Wrong? Bourke and Amberley as Case Studies” at the “The Sydney Papers Online”. Not a p-value to t-score in the entire paper. But there is a nice quote from Henry Lawson. But wait there is more. Check the co-authors; Dennis Jensen. FFS. She might as well have added SD and Nev for good measure. Hopefully my quoting you does do some good, although I suspect we don’t share the same concept of “good” in this instance. Jennifer Morassey is a charlatan. How’s her vital work regarding long term rainfall prediction coming along? Don’t bother asking her. She won’t say. Can you support this with a list of peer-reviewed journal articles ? Can you provide the abundant evidence ? Can you provide evidence of the refusal ? You need to go to Jennifer Marohasy’s website and do some reading there. She is not the only one to have pointed out the errors and inadequacies, but she is the leading Australian to do so. You’ll get other links in her essays. 1. You still haven’t provided any evidence to back up your claim that the CSIRO and BoM statements about hottest weather and future risks are not well supported by data. 2. I have complete faith in the work of the CSIRO and the BoM – damned fine institutions. I’m aware of Marohasy’s views and work. I won’t be going to her website. – Over the past week or so, the Bureau of Meteorology has stood accused of fudging its temperature data records to emphasise warming, in a series of articles in The Australian …… If true, this would be very serious because these data sets underpin major climate research projects, including deducing how much Australia is warming. But it’s not true. – There are many methods that can be used to detect these “inhomogeneities”, and there are other methods (although much harder to implement) that can adjust the data to make sure it is consistent through time. The Bureau uses such a technique to create its Australian Climate Observations Reference Network – Surface Air Temperature (ACORN-SAT) data set. – Australia has played a leading role in developing this type of complex data-adjustment technique. In 2010, the Bureau’s Blair Trewin wrote a comprehensive article on the types of inhomogeneities that are found in land temperature records. As a result the International Surface Temperature Initiative (ISTI) has set up a working group to compare homogenisation methods. – Far from being a fudge to make warming look more severe than it is, most of the Bureau’s data manipulation has in fact had the effect of reducing the apparent extreme temperature trends across Australia. – Marshalling all of the data from the Bureau’s weather stations can be a complicated process, which is why it has been subjected to international peer-review. The Bureau has provided the details of how it is done ( http://www.bom.gov.au/climate/change/acorn-sat/#tabs=Methods ), despite facing accusations that it has not been open enough. – Anyone who thinks they have found fault with the Bureau’s methods should document them thoroughly and reproducibly in the peer-reviewed scientific literature. This allows others to test, evaluate, find errors or produce new methods ………… Abandoning peer-reviewed journals in favour of newspaper articles when adjudicating on scientific methods would be profoundly misguided. An old perennial in climate wars is the adjustment of land temperature data. Stations are subject to various changes, like moving, which leads to sustained jumps that are not due to climate. For almost any climate analysis that matters, these station records are taken to be representative of some region, so it is important to adjust for the effect of these events. So GHCN publishes an additional list of adjusted temperatures. They are called homogenised with the idea that as far as can be achieved, temperatures from different times are as if measured under like conditions. I have written about this frequently, eg here, here and here. The contrarian tactic is to find some station that has been changed and beat the drum about rewriting history, or some such. It is usually one where the trend has changed from negative to positive. Since adjustment does change values, this can easily happen. I made a Google Maps gadget here which lets you see how the various GHCN gadgets are affected, and posted histograms here. This blog started its life following a classic 2009 WUWT sally here, based on Darwin. That was probably the most publicised case. There have been others, and their names are bandied around in skeptic circles as if they were Agincourt and Bannockburn. Jennifer Marohasy has for some reason an irrepressible bee in her bonnet about Rutherglen, and I think we’ll be hearing more of it soon. I have a post on that in the pipeline. One possible response is to analyse individual cases to show why the adjustments happened. An early case was David Wratt, of NIWA on Wellington, showing that the key adjustment happened with a move with a big altitude shift. I tried here to clear up Amberley. It’s a frustrating task, because there is no acknowledgement – they just go on to something else. And sometimes there is no clear outcome, as with Rutherglen. Reykjavik, often cited, does seem to be a case where the algorithm mis-identified a genuine change. The search for metadata reasons is against the spirit of homogenisation as applied. The idea of the pairwise algorithm (PHA) used by NOAA is that it should be independent of metadata and rely solely on numerical analysis. There are good reasons for this. Metedata means human intervention, with possible bias. It also inhibits reproducibility. Homogenisation is needed because of the possibility that the inhomogeneities may have a bias. Global averaging is very good at suppressing noise(see here and here), but vulnerable to bias. So identifying and removing possibly biased events is good. It comes with errors, which contribute noise. This is a good trade-off. It may also create a different bias, but because PHA is automatic, it can be tested for that on synthetic data. 3. I don’t believe your statement ‘BoM (in this case) refuses to explain in detail’. Can you give an example ? I’m not here to engage in a long dispute with you. I don’t have the time. I have explained why I don’t wholly trust BoM and CSIRO on climate matters. You think they are fine institutions, which indeed they may well be outside this contested area. You won’t go to Jennifer Marohasy’s site? OK. That’s your call. But then you miss the responses to your questions that she has provided. I don’t regard articles in The Conversation as at all authoritative. This is not adequate. Jennifer Marohasy’s site is less authoritative than BOM and casting dispersions against Tamino and The Conversation is opportunist. The same boring hand-waving can just as easily be applied to What’s Up With That or Marohasy. The BOM does not adjust data to suit external agenda’s and Marohasy’s cries over the adjustment for Bourke of a temperature of 125F is classic imbecility. She even launched a little performance of heading off to the National Archives to photograph her smoking gun. She is an embarrassment. On the other hand the BOM is answerable to Ministers and to Parliamentary Committees. Unlike Marohasy they habe the funds, resources and responsibility to cover all these issues. Comments from the peanut gallery notwithstanding. I don’t regard articles in The Conversation as at all (in any way) authoritative (trustworthy). I’m sure your opinion would surprise the editors. Here is Dr Pat Michaels submission last month on the “social cost of carbon”. This was before the US House of Reps and is very long and comprehensive. Judith Curry’s submission also found that the SCC was indeed minimal and should be ignored. Here’s Michaels address link and his conclusion . The social cost of carbon as determined by the Interagency Working Group in their August 2016 Technical Support Document (updated from IGW reports from February 2010, November 2013, and July 2015) is unsupported by the robust scientific literature, fraught with uncertainty, illogical, and thus completely unsuitable and inappropriate for federal rulemaking. Had the IWG included a better-reasoned and more inclusive review of the current scientific literature, the social cost of carbon estimates would have been considerably reduced with a value likely approaching zero. Such a low social cost of carbon would obviate the arguments behind the push for federal greenhouse gas regulations. More on the “social cost of carbon” junk science. Just more GIGO. Here’s the last couple of paragraphs of Judith Curry’s post on the SCC. Absolutely spot on. “Climate variability and change impacts water, food and energy. But there isn’t much we can do to influence the climate on the timescale of the 21st century — however much we have impacted the climate over the past 70 years or so, those impacts (large or small) will work their way through climate system over the next centuries as the oceans act as a big flywheel on the climate system. Back to the question posed by Revkin: Will Trump’s climate team accept any social cost of carbon? Well, I hope not. Here’s to hoping for a more pragmatic approach to all this in the Trump administration”. I am really too short of time to engage in verbal rallies about what I might have meant. If my words are unclear to you it may be my fault, and it may be yours. But no matter, I’m not interested in discussing what I might have meant, or whether what I wrote means that I must also mean something else. I have a good line in invective, and am willing to offer discounts to qualified applicants (mmm, not sure about former Vice Chancellors). Due to weather variability it is not reasonable to draw conclusions by comparing regional temperature over 1 year with merely 10 previous years. The immediately previous 10 years is not sufficiently long ago to represent climate change. You are comparing the current temp with almost the current temp trend. If you want to compare 2016 with any indicator of10 years, you need to go back to find a 10 year span at least 30 years or more. Selecting 2016 and a 10 year base period of 1979-1988 is a better way of observing the real temperature experience of the global hemispheres from Jan-Dec each year. In general the Antarctic has cooled slightly while the Arctic has warming substantially comparing 2016 with a 10 year baseline – 50 years ago (1957-1966). Please take this up with Professor Humlum. My reason for using the data and dates was set out in the essay. Don you have Squibb it. Here is a section of Michaels’ report to US House of Reps. This is comparing model projections to observed temps from 1979 to 2017 in the middle TROP over the tropics where most warming should be found. The models are wrong as can be observed and the weather balloons and SAT data show much less warming. “Another way to assess model performance is to compare model projection with observed trends in the vertical dimension of the atmosphere. Here again, as shown in the Figure below, models grossly produce much more warming than has been observed. This chart, courtesy of the University of Alabama at Huntsville’s Dr. John Christy, focuses on the tropics (between 20S and 20N)—the area where climate models project the greatest amount of warming through the atmosphere. The communal failure of the models is abject. The characteristics of the vertical profile of temperature are important environmental variables in that it is the vertical temperature distribution that determines atmospheric stability. When the lapse rate—the difference between the lowest layers and higher levels—is large, the atmosphere is unstable. Instability is the principal source for global precipitation. Although models can be (and are) tuned to mimic changes in surface temperatures, the same can’t be done as easily for the vertical profile of temperature changes. As the figure indicates, the air in the middle troposphere is warming far more slowly than has been predicted, even more slowly than the torpid surface warming. Consequently, the difference between the surface and the middle troposphere has become slightly greater, a condition which should produce a very slight increase in average precipitation. On the other hand, the models forecast that the difference between the surface and the middle troposphere should become less, a condition which would add pressure to decrease global precipitation. The models are therefore making systematic errors in their precipitation projections. That has a dramatic effect on the resultant climate change projections. When the surface is wet, which is what occurs after rain, the sun’s energy is directed toward the evaporation of that moisture rather than to directly heating the surface. In other words, much of what is called “sensible weather” (the kind of weather a person can sense) is determined by the vertical distribution of temperature. If the popular climate models get that wrong (which is what is happening), then all the subsidiary weather may also be incorrectly specified”. Here is the diagram of models versus observations in the TMT. See top of diagram for UAH V6 etc. Models are clearly showing far too much warming. These results argue strongly against the reliability of the Sherwood et al. (2014) conclusion and instead provide robust observational evidence that the climate sensitivity has been overestimated by both climate models, and the IWG”. So from you cited chart, I assume you would conclude that global warming at and below 250 hPa is at least 1C per century and reaches 2C per century at around 300 hPa. Would you conclude that further out there is a cooling tendency of 1C per century at around 100 hPa. Chris the balloon data mean shows 1 c per century at 250 but at 300 or the warmest point it does not reach 2 c per century. And becomes cooler and finishes at about minus 1 c per century. But the modelled data is hopeless and is showing far too much warming at every level. And UAH V 6 ( top blue cross) isn’t showing as much cooling at higher altitudes (60 hPa ) compared to the mean balloon data. In fact it is still about + 0.75 c .
I am less concerned about the actual data than the pattern which points to warming below and cooling above. The chart finishes at 100 hPa and the graph itself also finishes here and the trend at this point indicates more cooling at higher levels – towards 50 hPa. So we have significant warming @ 1C – 2C at lower levels and significant cooling higher up at 1C (100 hPa) and greater further out through the stratosphere. This can be observed within other layers than TMT. When you’re surrounded by friends, they say the fun never ends…..
Drongo, your own SNR seems to have gone up remarkably in the last week or two. Keep up the good work. 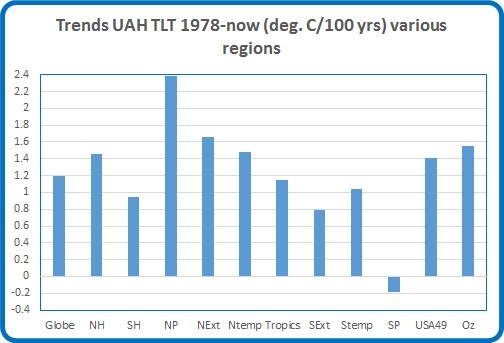 Ken Stewart has posted his UAH V 6 pause update since Feb . Australia temp has paused in the TLT for the last 21 years and 5 months. All regions of the globe are shown and graphs are available. South polar region has cooled slightly since Dec 1978. Perhaps you should show your UAH V6 update to these mangrove forests. Explain to them why they should not be dying. Why should you bother Neville, David? You have the article and the explanation. Too many years of low rainfall, some hot weather, and an el Nino that lowered the sea level by 20cm. Tell them that those clever scientists at JCU know. “We cannot afford to be caught out like this again!” said Dr Duke. Yes, Don, they really missed an opportunity there. They could have been orchestrating that one for months. The sea level mounding that happens in that NOTW from constant trade winds simply falls away in an el Nino and lack of rainfall did the rest. But it is an opportunity too good to miss for the bedwetters and they must be kicking themselves for their grant-missing blunder. Thanks, davey, for pointing this out. 1. Tell them that those clever scientists at JCU know. If you can’t get the point, then it will take me too long to explain it to you.Sorry. Don’t have the time. i’ll reply to myself. The notion disrespect comes to mind. Gee Dave I’m sorry but you’re wrong AGAIN. You see if you go to the BOM and check out rainfall since 1900 for Qld and Nthern OZ you’ll find an increase of 5.51 mm decade Qld and an increase of 11.5 mm decade for Nth OZ. Overall OZ is a wetter place today except SWWA (total WA much more rainfall) Tas and Vic is line ball. All other areas and states since 1900 have increased rainfall. All areas of OZ will always have droughts and flooding rains and the moronic idea that we can change this by using more S&W etc is absurd. Not only that Neville, evaporation rates have decreased over much of Australia since the 1970s. Together with the increased fertilisation from CO2 the place will soon be looking like Ireland. The BoM, what I do notice is that temperature has increased! I’ve always considered mangroves to be an opportunistic species. Since the building of the Wivenhoe dam they have proliferated along the tidal section of the Brisbane River. Silting from the 2011 floods caused massive dieback, they are now coming back. Easy come easy go. As you are aware you cannot use any particular region to comprehend climate change as it is a global effect and at different times some regions will be cooler and some warmer. It is the overall net effect, that is key. Your source shows a regional Australian trend since 1978 of over 1.5C per century. Also you need to take into account the fact that near the earths surface global warming increases evaporation and rainfall patterns change. This affects TLT temperatures. The only way to truly understand climate change is to look at all levels from ground level to around 50KM. You will see that TLT temps trend are cooler than TTT which is exactly what should be expected. Chris I suppose we could argue about all the IFS and BUTS and MAYBES for decades, but the scientists who believe in their CAGW will also tell you that we can have no impact on temp, climate or co2 levels for hundreds and perhaps thousands of years. There was a big scientific team who compiled the Royal Society/ NAS report and they state quite clearly that even if humans stopped all co2 emissions today we wouldn’t see any change for thousands of years. Meanwhile there are hundreds of new coal fired power stations to be completed before 2040 in SE Asia , China, India, parts of EU, Japan, Korea, Africa etc. So the RS/NAS conclusion is even more of a problem for the con merchants and liars in the Labor and Greens parties. And the Obama govt’s own EIA report also tells us that co2 emissions will increase by 34% by 2040. Just a pity that the ALP/ Greens liars and fra-dsters didn’t read these reports and ditto the gullible groupthinking leftie voters who really believe we can improve our climate by building more idiotic S&W energy. Trust me I’ve talked to some of these people and they are clueless about everything I’ve just stated above. What’s more some become very hostile and you can see the venom in their eyes and some actually resort to screaming because you dare to question their religion and holy books. Some also get very upset if you mention Dr Rosling’s ignorance project and how everything today is so much better than it was 50, 100, and 200 years ago. If you mention how so few people die today from extreme weather events ( a drop of 97%) this really infuriates the more extreme among them. Also ditto trying to convince some of them that the earth is now greening at a fast rate just excites them even more. I’m not sure how many really believe their silly nonsense but I’m sure a lot of it is political and certainly not any true concern about increased co2 emissions. All evidence points to a warming trend up to a certain point in the atmosphere and a cooling trend further out. This is conclusive proof that heat is being trapped within the earth’s climate system. This really is the end of the road. No “if’s”, no “buts” or “maybes”. Just thought I’d transfer my comment about our 2016 to 20 17 hot angry summer to this post on OZ warming. Interesting that we’ve been bombarded today from Steffen’s, Flannery’s Climate Council about our hot angry summer. It seems Steffen etc can see a trend brought on by their CAGW. But if that’s the case why isn’t the WA trend the same as eastern OZ? The WA anomaly for T max is cooler for last summer and the T max anomaly for Eastern OZ is warmer and the 2 halves have the same 400+ ppm co2 driver??? Magical stuff this co2, it can cause a hot angry summer in the east and a cooler summer in the west. Amazing and of course Nat weather variability wouldn’t have anything to do with it? Same goes for rainfall as well. Just incredible isn’t it? Any thoughts? Sorry here is the anomaly graph for DJF. Given the regard you have Dr Curry and her climate views and the problems you have with data adjustments, averages and modelling, you might find it worthwhile looking at the current post and comments at ‘RealClimate’ – “Predictable and unpredictable behaviour”. Tamino from ‘Open Mind’, who I respect greatly for his knowledge and expertise, makes some incisive comments. Thanks for the link. As it happens I’m a subscriber to RealClimate anyway. I’m not impressed with the Tamino argument, but in any case, I’m sure JC will respond. Then I’ll have an opportunity to consider the debate. As best I can tell, Tamino doesn’t introduce any new arguments does he? He seems to be highlighting, emphasising and praising Rasmus Benestad’s argument. In any case, perhaps while you wait, you’d like to share what you find unimpressive about it? JC might even appreciate the help. Tamino calls himself ‘Hansen’s bulldog’, but Judy Curry doesn’t need me to act as hers. Don stop the press, after 4 years I have found something you wrote on climate science upon which we can agree. Hate to tell you, davie luv, but you stuffed up again. That wasn’t a cold year auntie was referring to, just a cold winter. And they claimed the cold wasn’t going to last. Where have they mentioned the last 3 cold months? Looks like both you AND auntie stuffed up. What part of this opening statement by the ABC do you have trouble understanding? Take your time and work through the sentence, one word at a time. Weatherill cracks under pressure and once again displays his ignorance about energy blackouts in SA. South Aussies pay the highest prices in OZ for their electricity and get blackouts in return. Even Dr Hansen admits that S&W are just fairytales and yet this is what we can expect more of if the voters are stupid enough to elect a Labor Green coalition at the next election. I have been very sceptical about claims of anthropogenic climate change partly because of something that happened at school way back in 1976 when I was in Year 10 at a high school located at Starke Street, Holt (it has been demolished since so I don’t think there is any problem from identifying it). In almost the last school day of the year, a science teacher gave us a talk about how we in the west used too much electricity and how wrong it was that people in developing countries didn’t have enough. But the main point was that we used too much electricity. I still remember it now because it was the first time I ever walked away thinking the teacher was talking rubbish and politically slanted rubbish at that. So many questions went through my mind like ‘There isn’t a fixed amount of electricity; what’s to stop everyone else having as much as we have? Why do we have to cut our consumption back because we use “too much”‘. I cannot get out of my mind the thought that a lot of the climate changers’ belief is that we use too much electricity and we should use less just because it’s wrong to be so greedy and that the climate change belief system offers some scientific valuation of that belief. The argument that scientists who question anthropogenic climate change, should have their views disregarded because they are “deniers” appears to me to be circular logic and not deserving of serious consideration notwithstanding the physical threats which often accompany the argument. I am very glad to see your website and I wish you every success in the future. When I said “valuation” I meant “validation”. My apologies. I agree john with your observations. There seems to be a reverse motherhood statement in the West now that consuming too much of anything is morally wrong. I thing with the established Church in decline people are looking to other areas for a moral compass. Fortunately for the self righteous, traditional religion is no longer required. dlb Greed has always been seen by the Church as morally wrong. Its included in the seven deadly sins. So I am not sure that you have observed anything new. Thank you; yes I think the discovery of anthropogenic climate change was the answer to a lot of these people’s prayers. Not that they “prayed” of course but you know what I mean. John most of the biggest personal consumers of energy are the wealthy hypocrites like Gore and Di Caprio etc. These types of CAGW extremists actually own personal jet airliners to fly them and their friends around the globe. Just incredible but true and both of these disgusting HIPPOS own many mansions as well, just to prove that they actually couldn’t give a stuff about increasing co2 emissions at all. Indeed Neville; actions speak louder than words. When I see Gore and DiCaprio conduct meetings by Skype because they are too worried about their carbon footprint to use their private aeroplanes then I will take anthropogenic climate change seriously. If they’re not worried enough to change their lifestyles, I don’t see why I should be. More on the SA fairytale . Some good comments at this link. Maybe it would be better for you if you got it out of your “mind the thought that a lot of the climate changers’ belief is that we use too much electricity ” and listened to the science folks a bit more. Scientists say we are using too much fossil=fuel generated electricity, and there is every reason that we can have as much electricity as we want provided it does not threaten humanity through global warming. If you follow the arguments you will note that there will always be a minority who are driven partly by fossil fuel lobbying and partly by subjective desires to retain their current lifestyles. The science is clear, we know that different gases transmit different wavelengths, that humans are changing the gas composition of the atmosphere, and that more heat is being trapped below the stratosphere, and so the heat being re-emitted into space is falling at over 7C per century. I have not seen any scientific explanation for this warming and associated upper atmospheric cooling trends. So in the absence of a scientific argument – inevitably the label “deniers” arises because we have seen such debased arguments over slavery, nicotine, women’s rights, asbestos, smallpox, repetitive strain injury and the Holocaust.. Questioning science without evidence does not change science based on evidence. There is no scientific basis for so=called scientists to question this. Thank you for reading my post but I fear you have missed my point – that belief in anthropogenic climate change fills a psychological need for people who do not believe in God or Allah but are nonetheless looking for some noble cause in which to participate. The sceptics are also able to present evidence that anthropogenic climate change is not occurring or at least not to any statistical significance. The fact that you are able to present data to support your case does not invalidate the data which the sceptics present – especially as I say since most sceptics’ arguments are based on observation while much of the believers’ arguments seem to be based on modelling (although I note “homogenised” data has been introduced in recent years). I don’t think it is valid to say this is my data, it proves my point and anyone who doesn’t accept it is not worthy to hold an opinion. You would need to disprove their arguments. If would like to take it up with a sceptical scientist I can think of a few who would happily debate the issue. If you simply wish to apply labels to people who do not agree with you, that is of course your right also. “listened to the science folks a bit more.”. But more than this, I would say that denialism in general “fills a psychological need for people” or subjective angst, such as not wanting to give up a certain lifestyle even though science points in this direction. Examples. The psychological instinct to view man as the centre of the universe led to Ptolemy view of the solar system. This was corrected by science – Copernicus. The psychological instinct by one race to view other races as inferiors, serves to satisfy another psychological need, but is corrected by science. You make a claim about climate change occurring but not statistically significant. But if you look at the scientific data you see that so much heat is being trapped in the Earth that temperature readings above CO2 levels are falling at over 7C per century. This is statistically significant and is not based on modelling. Maybe you could explain your concerns a bit better. Oh dear. I think that anthropogenic climate change is a solution in search of a problem – that there was a belief expressed by my science teacher in 1976 that we used too much electricity which I felt at the time was irrational. However, some years later climate change came along and that at last this gave a reason for believers to argue that we did indeed use too much energy. While I did listen to my teacher at the time – I had little choice you will understand – as I have detailed earlier I did not believe her argument – that we used too much electricity – and you will no doubt be glad to hear that. You will see from a comment above that it is not just sceptics who have difficulty giving up a certain lifestyle; well known believers such as a Messrs Gore and Di Caprio appear reluctant to give up their lifestyle (of which I am deeply envious). We are perhaps more honest in that our statements are consistent with our actions. As it happens, I think these gentlemens’ actions show that they don’t believe in anthropogenic climate change any more than I do. I don’t know if you have made any personal contribution to forestalling anthropogenic climate change. If you have, well done for practising what you preach. You have also suggested that non-belief fills a psychological need in people. This is the first time I have ever seen such a claim which does not make it wrong of course but it seems a strange argument. I would not suggest someone who did not believe in God, Allah, Buddah, or any other deity was filling a psychological need. Perhaps a Buddhist might consider that someone who didn’t believe in Buddha was filling a psychological need – I don’t know. You also suggest that I have used labels such as believer and sceptic while you have used the label denier. I think this can only mean that the terms “sceptic” and “denier” are interchangeable, however, from your other comments is clear that you use the word “denier” because you regard it as more pejorative, hence my comment. If you have not witnessed a climate sceptic threatened with violence, well I could respectfully suggest you try getting out more but perhaps a viewing of “Q and A” the next time they have a sceptic on will show you what I mean. Or you could swap hats and present a lecture at a university questioning anthropogenic climate change and then you will see what I mean. We could continue to trade links for evenings to come but I do not see any point in this. I don’t think you can label someone as a denier if they don’t agree with what you believe to conclusive evidence if other people are able to make a scientific case that the evidence is insufficient to allow the conclusion to be drawn. To go back to my first post, the standard argument scientists who make a case that the evidence does not prove that anthropogenic climate change is occurring,, is that they are deniers whose views are unworthy of consideration – that is circular logic. If you are not one who does this then well done again and I wish I had met you rather than the aggressive types I have come across. Comparing the mean for 2016 against the mean for the last 10 years to imply minimal warming is just a glorified exercise in cherry picking. You could presumably half the “warming effect” by comparing the mean for 2016 against the mean for the last 5 years, or half it again by comparing with the mean for the last 2.5 years. Or why not go all in and compare the mean of 2016 with the mean of the last 1-year and then you could report no warming at all! And what purpose does it serve to designate colors for + 14 degrees and – 14 degrees, when the range of the entire data set is +2 to -1 degrees. The arguments you choose to latch onto are embarrassing. I guess it suggests Ole Humlum is a believer. He wants his graphs to be future-proof enough to show a 14C anomaly between the mean for one year, and the mean for the previous 10 years. I’m pretty sure he’s the only person on the planet anticipating that day. I doubt even Don’s data-fidlers would be able to pull that off. The conspiracy theorists amongst us might think he’s jammed his entire graphic into just 15% of the dynamic range of the scale so as to declare “nothing to see here”. Those dark reds and purples and dark blues and blacks look too alarming… best to make sure they never appear. The analogy is a disturbingly good one: a deep mis-trust of experts in the field, and an almost blind faith in anything found on the inter-webby. I think that “anthropogenic climate change is a solution in search of a problem”. Scientists do not think this. It is societies’ actions that need to be consistent with science. I never suggested “that non-belief fills a psychological need in people” so obviously “This is the first time I have ever seen such a claim”. You are also the only person who has seem such a claim. You used labels such as believer and sceptic while I have used the label denier. Whether the terms “sceptic” and “denier” are interchangeable depends on the degree and scientific method used under the cover of “skeptic”. They are not immediately interchangeable. You need to provide a link to the QandA program. Vague references will not do. Which university course and lecturer threatened students with violence. You are making this up. Data scientists do need to adjust data readings over time. A key tactic of denials is to ignore hard facts and data. Neville has provided had evidence for upper atmosphere warming (@ 2C per century) accommpanied with significant cooling at higher levels. I gave the data showing cooling at over 7C century. You have ignored all this. Deniers have the same rights to have their views considered based on the science they bring to the discussion. Musings on science high school teachers comments is not adequate. At a certain point, Copernicus must replace Ptolemy. It might be better if you calmed down before writing future posts. I didn’t quite understand your first few sentences especially when you said you think that anthropogenic climate change is a solution in search of a problem. That’s what I said. Did you mean to agree with me? Are you using a dictaphone? I find your comment “it is societies’ actions that need to be consistent with science” to be very instructive albeit disturbing. Would you care to explain what you meant? You said “I would say that denialism in general “fills a psychological need for people” or subjective angst, such as not wanting to give up a certain lifestyle even though science points in this direction”. But then I read that you never suggested “that non-belief fills a psychological need in people”. Again I’m lost but if you would like to explain the difference, go for it. The universities included WA and SA http://www.uwastudentguild.com/bjorn-lomborg-has-no-place-at-uwa/ https://www.getup.org.au/campaigns/climate-action-now/climate-action-2015-1/who-exactly-is-bjorn-lomborg-help-get-the-word-out?t=dXNlcmlkPTU2NjExMCxlbWFpbGlkPTMyMTU%3D. As I say, I suggest you try it yourself and see what happens (but take a few rugby players with you). There is a reason why you give your full name while I give only my christian name. As for data scientists needing to adjust data over time, enough said. I note that it is apparently invalid for me to copy stuff from JoNova but OK for you to link to websites which support your argument. And yes, I already know the reason for the difference: because unbelievers are wrong anyway. A key tactic of believers is to avoid debate. I refer to the Q&A episode with David Suzuki where he insisted that no other speaker would be on the program with him. Your last paragraph lost me again but to clarify and reiterate the reason I chose to enter this webpage, my high school science teacher was looking for a reason to believe that our western, consumerist and capitalist way of life was wrong and the discovery some years later of the need to take action on anthropogenic climate change provided confirmation of the belief by her and so many other like her. Hence, my comment that it was a solution in search of a problem. You have urged me to discount such assertions by my teacher and I have done so with pleasure. I do not pretend to be qualified to make assessments as to the relative strength of one side over the other although I note the tendency for the believers to rely on models and data which is homogenized, or to use your term: “adjusted”. I also note the pause in temperature for approx. 15 years notwithstanding the evident increase in pollutants all over the world during that time. I know that your link is intended to discount that and I see that Professor Aitkin has addressed the issue far more eruditely than I ever could. But to bring in a point that I was discussing with another commenter, when I see prominent believers such as Al Gore, Tim Flannery and David Suzuki etc refusing to fly in aeroplanes because they are worried about the carbon footprint, then I will take AGW seriously. At the moment, I don’t think they believe it any more than I do although I am sure they see it as a way of making serious money. There have always been people like that and there always will be. It’s just that they are starting to make life very challenging and expensive for the rest of us. I see you are able to contribute prolifically to this webpage each day. Unfortunately I have difficulty getting here outside of weekends but I will do my best. But if we are going to continue to correspond, something I have wondered for a while: are you the Chris Warren from the Media, Entertainment and Arts Alliance? I am sorry if you do not understand or think you get lost. Your accusation that people avoid debate is false. You have ignored the evidence I pointed you to. I invite readers to read your posts and mine and draw their own conclusions. Btw the story about suzuki is true. If you know of any debates taking place, let me know. You seem to be caught up in your own paradox there Don. On the one hand you argue the ‘adjustments’ are designed to make the warming appear much worse than it is, and on the other hand you argue the adjusted data doesn’t show much warming. And the whole homogenized data argument is a bit of a furry. Half the time the adjustments increase the warming trend and the other half the adjustments decrease the warming trend. Analysis with un-adjusted data produces the same results which support AGW. Don has has this pointed out to him numerous times over the years. But is happy to ignore this inconvenient fact and repeat his “the data are cooked” allegations for his own entertainment. There is one technique that researchers use that does fairly reliably lead them to conclude the warming is worse than previously thought: improve the coverage by adding more sensors. If anything, that says to me that all that data-filling that keeps Don awake at night is fairly conservative in its predictions of warming. They selected a sparse subset of Argo readings roughly located where earlier ocean observations were located, and then used the data-filling algorithms to fill-in the temperatures in other locations where they now had Argo readings and compared the results of data-filled Vs measured. What I recall from those data is that the more accurate data, collected in the most recent times, showed an increased warming trend compared to earlier trends obtained from ship buoys etc. I suppose the best way to summarise 2016 is to use the combined trends of UAH, RSS, GISS and HadCRU after removing the impacts of volcanos and ENSO etc. I don’t know if this has been done, but I expect it to generally continue the trend so far revealed up to around 2013. “How much of the observed warming trend (over what period) is due to GHG? Who says so, and on what basis?” This is Don’s query today. How many times have people been shown the different gas absorption spectra of GHG’s by wavelength. This is scientific proof that increased heat (long wave) is trapped. You can replicate this in a lab. The IPCC has estimates of what they term “forcing”. They say so. True skecptics would produce their own lab results for gas absorption spectra. But they don’t. We know that there is approximately at least a 2C warming trend in the atmosphere, and a cooling tend of over 7C above. This is 100% generated by GHGs. Previous warming episodes were cause by changes that would naturally reverse.. So this answers, how much, who says, and on what basis [over 7C, scientists, instrumental data]. At least as long as the satellite record exists, and will therefore continue into the future with no reverse. Oh dear, it doesn’t answer those questions at all, but you can’t see it. Poor Jennifer – the sudden surge in global warming is nothing but the continuing trend observed over the last 30-40 years. She would have us believe the surge is due to BoM putting on more staff to falsify the data. Could you provide the link to the source of this quote, Chris? The general point she was making in her essay was that the scientists who had consistently denied that there was a pause were saying, in March 2016, that the pause had ended. The sentence you quote is context-less, and means nothing without its proper surrounds. You might take this up with her. She seems to respond to critical comments if they are sensibly made. What is your source for satellite with SOI taken out. You also need to take out volcanos and impact from changes in solar insolation. When this is done – there is no two phases in the remaining trend. There may be in the raw data. I thank you for the link to SS and the two graphs. I would be so much more persuaded if I knew more about the graphs, who did them, and the like. My analysis of SS arguments and data so far does not fill me with appreciation for their honesty or accuracy. Thank you, Gary. I’m travelling and don’t have much time. But the F&R paper is from 2011, whereas the cited link from SS seems to have data from 2016, why can’t be from that paper. I’ll look further in a day or two. Another moronic statement from Marohasy (2005). And some want to use this rubbish to cast dispersions on the BoM. Can’t you find a more recent aspersion than this one? What did you say in 2005 that turned out to be premature? You can only point out a failed prediction after a reasonable period. If I claim the globe will get cooler, this needs at least a decade of experience. There has been no change in logic coming out of Marohasy that I am aware of. Her story is an old story. Chris there must be scores of junk forecasts claimed by stupid CAGW extremists every year. Jennifer has been one of the few sane people who can hold her head up today. The good thing is her very rare mistakes don’t cost the taxpayer tens of billions of $ to try and fix a non problem. Of course their stupid mitigation fairytales wouldn’t make any measurable difference to temp or co2 levels or SLR or extreme weather events or polar ice or polar bear numbers or our ( now) very high life expectancy or our greening earth or just about anything else you may care to mention. We are very lucky to live in today’s world with all the technology, science, health and medical care plus a much higher standard of living. . All of this in just 200+ years and all started because of fossil fuels and still underwriting our hopes for the future. The point at issue is those citing an ex-IPA provocateur to cast dispersions on the BOM. No one challenging BOM current data for Bourke for 1909, can hold their head up today. Her rant, on February 13, 2017, was not an exercise in sanity. Neville, you should know by now that chrissie just can’t cope with the idea that any record temperatures exist historically except cool ones. No matter what compelling evidence is provided. Same faux science philosophy as BoM, ABC, The Con. awa the usual gatekeeper suspects. Plus his usual dose of scientific ad hom. The message coming from Jennifer is consistently and rightfully one of scepticism of the attitudes of “science” wrt AGW. With a total of only 0.8c of warming since the LIA and very little this century it is around half of natural climate variability for the last 8,000 years and a fraction of the nat var that was occurring earlier. And with no quantification of CO2’s warming capacity she is more likely to be correct than the chrissies. The Bolter gives us more of those junk forecasts from Flannery and the so called scientists over the last decade or so. Unbelievable nonsense and yet some still believe their cult leaders and their holy books. And the cult leaders even hope that some of these delusional cult followers will yet again hand over 8,000 $ to hear even more lies and drivel up north. Incredible but true. Ken Stewart has now updated his post about the BOM measurement of temp around Australia. He has been helped by a large team and even Mike R has started to take an interest in some of their discoveries. The new instruments actually record temp second by second and minute by minute and there are still no error bars quoted with the BOM graphs. So how much of our so called warming over the last 30 years is just noise and of course our UHIE adjustment seems ridiculously low as well. BTW here’s that northern OZ rainfall again from the BOM. This might help Flannery and his BOOGA BOOGA cult followers up north. This anomaly graph shows just how much less rainfall was received from 1900 to 1970. Much more rainfall over the last 47 years. What’s not to like? I noticed you did not show any understanding of the 47 years extra rainfall. Does extra rainfall, mean extra prior surface evaporation? Does this impact on surface temperatures? Oh, dear! The bleedin’ obvious is always very obscure to the blitherers. Hint!!! It comes under the heading of “anything else”. Neville has provided interesting facts about increasing rainfall over the last 47 years. This may help understanding what this means. Poor brainwashed chrissie will believe anything that’s convenient to his religion. D’ya possibly think, chrissie luv, that if we had more data over longer periods we just might discover that much of the world contains places of drought and flooding rains? There are so many things we don’t know and assumptions aren’t the answer. Rational scepticism is the only answer under those circumstances. Based on putting your head out the window occasionally and making observations. Chris I think that our climate changes in lots of ways that we certainly have little control over. While we can find opposite changes in rainfall over the last 40 years like more rainfall over most of OZ and most states we can also find lower rainfall over SWWA and Tassie. I am positive that co2 had little impact that some how gave us more and less rainfall over the same 40+ year period but in different places. But here’s a new 2017 study of the MDB over the last 90,000 years and covers the last glaciation through to the incredible SLR after about 19,000 YBP. This study also incorporates parts of China, Borneo, PNG and parts of the Pacific etc. It uses the cores from the Murray mouth near Kangaroo Island to try and understand the contributions from the Darling and Murray rivers over tens of thousands of years. During the glaciation most of the water seems to have come from the Darling, but in more recent times the lower Murray system seems to be the major contributor. We’re very lucky today that we have locks and weirs/dams that have allowed us to store excess water in the good times to be used in periods of extended droughts. The severity of the last big drought was enhanced because of the IOD positive cycle that lasted for many years. Last year was one of the wettest winters on record because the negative, strong IOD was the major contributor to SE OZ and lower MDB rainfall. Here’s a summary of the study from the ANU and the full study link. Note Prof De Deckker is still going strong, even though he has to throw in a touch of very unconvincing impact from AGW . Well sort of anyway. Here’s Prof De Deckker’s Feb 2007 Catalyst program that looks at OZ droughts over the last 5,000 years. You can read the transcript or watch the video. ( under 10 mins) We were just coming to the end of a very bad drought (2010 to 2011) enhanced by a very long positive IOD. BTW the IOD wasn’t understood in 2007 but the discovery was reported on in Feb 2009. You can pause the video when the graph’s completed to see 3 earlier bad droughts over the last 5,000 years. After about 8 mins 50 seconds, but it will take a bit of patience. Of course Calvo et al covered a lot of this history and found that indeed southern OZ has been cooling and becoming drier over the last 6,500 years. Here is the UNSW study that discovered the IOD impact in Feb 2009. The graph at the end shows the positive IOD period that had a major impact on this very severe drought. But the Murray kept flowing unlike 1914 and other natural severe droughts in earlier times. This is the only factor that explains the current temperature increases in lower troposphere and cooling further out plus the warmed layer as recorded in balloon data..
How do you figure, chrissie luv that 0.8c of warming in the last 166 years “equals or exceeds” what has happened naturally in the distant past when just in the Holocene alone there have been considerably warmer periods and a temperature variation of more than 4.0c? You really are a bit of a simpleton SD. You talk about 4 degree temperature changes during the Holocene. There were also large sea level fluctuations during the same period. This is what we are keen to avoid. Chris you couldn’t have chosen a worse study than Marcott 2013 to try and support your case. Steve McIntyre quickly pulled it apart with his usual forensic skills and use of proper data. He forced Marcott to admit the 20th century uptick was not ROBUST?????. What a joke and here is the Marcott filibuster. In fact everyone now accepts that this was a BS study and all the sceptic blogs have had a field day for years at his expense. Here’s a series of posts from Steve about Marcott if you’re interested. ClimateAudit is not a respectable source and is running their own agenda. Much of their commentary is subjective and self-interested. Marcott was published in leading scientific journals, and if there is any further discussion, that is relevant, it would have been submitted to Nature, Science, or Scientific America etc. It is more a case of Steve McIntyre and those of his ilk, getting mightily upset and working themselves into a lather. The Drongo’s bark, but the caravan moves on. And blithering, bothering chrissie remains as brainwashed and recalcitrant as ever. No idea about those two warm periods, hey chrissie luv? But that ad hom is a great taw, ain’t it? At least McIntyre gives honest and logical answers. However embarrassing you may find them. And blithering, bothering, chrissie remains as brainwashed and recalcitrant as ever. Have a butcher’s hook at the lies and propaganda being pushed into the heads of kids by NYT. If there was no CO2 we would be in a natural cooling period. A modicum of additional CO2 may well have been beneficial, but not the continuously increasing trend we see today. I luv your demonstration of settled science, chrissie luv. I wonder what they will be telling us next year? “If there was no CO2 we would be in a natural cooling trend”. Should you look at the temperatures taken from ice cores at both Greenland (Northern Hemisphere) and Vostok, Antarctica (Southern Hemisphere) over the past 8,000 years the trend is indeed one of cooling. The warming over the last 150 years is far too short a time-frame; rather like having a hot day in late autumn and assuming winter will not happen. According to recent article in Scientific American, for the third year carbon dioxide emissions have been level, yet at Mauna Loa, CO2 measurements show a continuing linear rise over this period. If mankind’s emissions continue to flat-line but atmospheric CO2 levels still rise, the AGW hypothesis has a problem. Is this supposed to be a remotely serious comment? This has to be one of the sillier posts to this site. God only knows SD and Nev have given you a run for your money. A thought bubble constructed from three data points. And davey is even more brainwashed than chrissie’s: “If there was no CO2 we would be in a natural cooling trend”. Here, blow your mind with reality, davey. How big a picture would you like? And even using a picture 1/20th that size still shows cooling. What is the reference to the Scientific American source. I know the IEA has recently noted that CO2 emissions from production of energy have levelled-off, but I am not sure what the 2015 global CO2 emissions from other sources . Growth in energy-related CO 2 emissions stalled completely in 2015. However once you factor in land use, cement, and change in land and ocean sinks, you find a completely different story. The CDIAC data suggests (to me) that – if present trends continue, there will be a humanitarian catastrophe. Scientific American 20 March 2017 – the quote was from the International Energy Agency. Ross, all that tells you is that our current levels of CO2 production rates are higher than the planet is able to absorb them so the excess accumulates in the atmosphere. That’s precisely what the “AGW hypothesis” says. The only way you’d see a corresponding decrease in the atmospheric concentration is if the system were still in balance, but we’re already well past that stage. My understanding is that CO2 levels were steady at around 270/280 ppm until mankind started burning fossil fuels which released more of the gas into the atmosphere. The AGW hypothesis is based on the human increase in CO2 and that we are responsible for the difference between 270/280 ppm and the current level of over 400 ppm. It seems obvious to me that if CO2 levels continue to rise but our emissions do not, humans can not be solely responsible. The problem then becomes how much of the increase is natural and/or human. Ross I don’t think that follows at all. There are sources and sinks. Think of it as a bath tub with a very slow drain. Provided the amount of water flowing into the bath tub is faster than the drain, the level in the bath will go up. For most of the last century we’ve been turning the tap on harder and harder. Using your data above, for the last 3 years we’ve left the tap untouched (we’ve not turned it off or down) and so the water continues to rise. That doesn’t imply the water is rising because of some other source, it implies that the current in-flow rate is higher than the drain rate. That’s what Tony Abbott signed us up to for instance. So countries have signed up to turning the tap down to lower than 2005 levels (by about 25% in our case). That it’s been flat for 3 years is a start, but you ain’t seen nothing yet. Even if the world does achieve those goals, CO2 levels in the atmosphere will continue to rise because the in-flow rate is still higher than the drain rate. They’re trying to limit the trajectory. The only way to get the atmospheric concentration to flat-line like you’re looking for would be to stop all emissions today (or come up with a very impressive sink). Hey Ross you’re talking about the REAL planet earth. Chris likes to talk about a fantasy planet where the much warmer Eemian didn’t exist and he’ll only use our links if it fits his fantasies. Who cares about the last 150 years and the coldest period and record ice levels for 10,000 years during the LIA. According to Chris we should return to the climate of 1800 and the tender mercies of a minor ice age. But he just loves ” upside down Mann” and other fantasy studies based on adjusted distorted data. OK apologies to Ross Hansaker. Ross your comment is no longer silliest comment on this site. I believe Margret just took out that award. Here’s what the world was like before the popular use of fossil fuels.. We were all poor and sick and not much different life expectancy for thousands of years. But that changed in just 200 years to the wonderful world we live in today. Prof Rosling uses the full data base to show this very quick journey in just 5 minutes. IOW the world was totally changed since humans first walked the earth because of fossil fuels. You should take particular note of Rosling’s last sentence in this video. It appears you have not looked at the carbon emissions data I cited. Combined with net fall in sinks, this has created (for 2015) a record rate of carbon accumulation in the atmosphere – 6.3 GT. This exceeds the previous high recorded for 1998. If is possible for CO2 to rise while our emissions do not, through out-gassing from land and oceans. This is a nasty feedback. Creator of Warming on Earth. I believe in Climate Models, the only guides, our Lords. From thence they shall come to judge the emitters and the dead. Hey David, the first substantial cyclone for the season is building off the Qld coast. I’m sorry you’re right, I’m wrong, it must be evidence for AGW. Chris I think you’re beyond help and you’re starting to lose a grip on reality. Rosling this time is completely wrong. The best data forecast until 2040 comes from the EIA and the IEA. I shouldn’t have to keep reminding you of these points but here goes AGAIN. The EIA states that human co2 emissions will increase by 34% by 2040 and most of that increase will come from the developing world. The RS and NAS report actually states that there is nothing we can do for thousands of years to lower co2 emissions or lower temps etc. I’m using your side of the argument by quoting these 2 so called premium scientific institutions. I may not completely believe their claims but a team of true believing scientists who compiled this report really do believe it. Rosling states at the start of my video link that the industrial revolution started this amazing change in human wealth, prosperity and incredible increase in life expectancy. If you don’t understand this you really are beyond help. Alex Epstein and Bill McKibben had a long debate recently and McKibben agreed that our wealth today has been because of the use of fossil fuels. Now Bill is a very prominent true believer and has a web site called 350.org and this signifies that he would like to see co2 emissions level out to 350ppm. Dr Hansen agrees this is his aim as well, but the RS and NAS report points out the problems involved in achieving that aim. Geoffrey Blainey looked at the stats for life expectancy between Europeans and Aborigines and found there was little difference in 1800. ( Triumph of the Nomads) Therefore this supports my claim that there was really no increase in wealth and life expectancy for humans until after the start of the industrial revolution. It really didn’t matter whether you lived in Europe or lived as a stone age hunter gatherer in OZ. Your AVERAGE life expectancy was less than 40 years of age. If you don’t believe what I’ve written above I’d you like to give us your version of human history since 1800. BTW the world generates over 80% of TOTAL energy today from fossil fuels and S&W generates about 0.6% of TOTAL energy. The IEA has told Lomborg that this may increase to 2.5% by 2040. Remember Rosling’s description about the human world before the Industrial Rev. In the bottom left corner all the countries were poor and sick and we can now see the results in the 21st century. Don’t forget a baby born today in the first world has an average life expectancy of about 90 years of age. As cyclone Debbie starts to threaten I suppose we should look at the data since 1970 from the BOM. There has been a slight decrease according to the graph at this link for both categories of cyclone. That’s non severe and severe. Let’s hope that Debbie does little damage to life and property and best of luck to everyone. I have not dealt with most of the issues you have raised. As Don Aitkin would say, if you disagree with Rosling – take it up with him. I have only demonstrated that there is increasing CO2 and that this is trapping heat so that temperatures below are rising and temperatures above are cooling. You provided balloon data that is consistent with this. This is entirely independent of any issue you cite from Alex Epstein, Bill McKibben, Dr Hansen or Geoffrey Blainey etc. but without providing any reference. Lazy vague approaches will not get you anywhere. You cannot access whether our climate is being disrupted by looking at a single cyclone or single region such as Australia. The green bars include cyclones. Chri here is question 20 and answer that I’ve supplied before and the RS/ NAS link. 20. If emissions of greenhouse gases were stopped, would the climate return to the conditions of 200 years ago? No. Even if emissions of greenhouse gases were to suddenly stop, Earth’s surface temperature would not cool and return to the level in the pre-industrial era for thousands of years. If emissions of CO2 stopped altogether, it would take many thousands of years for atmospheric CO2 to return to ‘pre-industrial’ levels due to its very slow transfer to the deep ocean and ultimate burial in ocean sediments. Surface temperatures would stay elevated for at least a thousand years, implying extremely long-term commitment to a warmer planet due to past and current emissions, and sea level would likely continue to rise for many centuries even after temperature stopped increasing (see Figure 9). Significant cooling would be required to reverse melting of glaciers and the Greenland ice sheet, which formed during past cold climates. The current CO2-induced warming of Earth is therefore essentially irreversible on human timescales. The amount and rate of further warming will depend almost entirely on how much more CO2 humankind emits. Chris here is Roger Pielke jnr’s link quoting the latest IPCC AR 5 report in 2013. Your waffle link is a mixture of apples, oranges and breadfruit. Goklany, Lomborg, Ridley, and Rosling have all used the proper data referring to the 97% reduction in deaths since 1920s from extreme weather events. I had been scheduled to testify before the House Science Committee next week in a hearing on extreme events, but the gong show in Washington has put that off. In the process of updating Senate testimony given back in July (here in PDF) I did compile some key statements from the IPCC AR5 WGI Chapter 2 on extremes. There is really not much more to be said here — the data says what it says, and what it says is so unavoidably obvious that the IPCC has recognized it in its consensus. Of course, I have no doubts that claims will still be made associating floods, drought, hurricanes and tornadoes with human-caused climate change — Zombie science — but I am declaring victory in this debate. Climate campaigners would do their movement a favor by getting themselves on the right side of the evidence. Judith Curry will appear before the House of Reps to give testimony on the 29th of March. Curry, Christy, Pielke jnr and USDM Mann all at the same hearing. What a hoot. “Witnesses: John Christy, Judith Curry, Michael Mann and Roger Pielke Jr. The hearing will be held next week, March 29. The announcement for the Hearing is [here]. I’ve completed my written testimony, I will post it Wednesday once the Hearing has commenced. It is the first time I will be on the same panel as Michael Mann. This should be high theater for climate geeks. Dr Hansen called Paris COP 21 just BS and fra-d and he called a belief in S&W akin to believing in the Tooth Fairy and the Easter Bunny. Just a pity that the thousands of fools who cheered on this idiotic nonsense didn’t understand simple maths and simple logic and reason. But now we hear that the deal is as dead as Monty Python’s dead parrot. The Trump admin will gut the EPA and sack a good number of layabouts and hopefully quickly finish off this silly fantasy. And heaps more corruption and fraud across the EU, with a number of countries milking the system to pocket up to 600 million $. Their so called CAGW seems to attract the liars and con merchants like flies around a dung heap. Here’s Jo Nova’s summary and the link. Taxing a basic molecule of life on Earth was never going to be easy. EXCLUSIVE/ European Union countries exploited loopholes in United Nations forestry rules to pocket carbon credits worth €600 million and the equivalent of global-warming emissions from 114 million cars. That’s slightly more cars than exist in Germany, France and Italy combined. You will not believe, governments overstated their logging targets then claimed credits for the forests they didn’t cut down, and the EU paid them for it. Just saving the world, one lie at a time. The document said that leaving the loophole open risked 133 million tonnes of unearned carbon credits falling into governments hands. 133 million tonnes is worth €665 million at today’s carbon price and is equivalent to 127 million cars on the road. You crude comment: “Your waffle link is a mixture of apples, oranges and breadfruit.” is a false accusation. The link shows trends over time of meterological, hydrological, and climatological events. It is necessary to use this data to understand climate change. You have also cited a source without reading it or understanding it. The report is not a report but a Q&A and does not say there is nothing we can do for thousands of years to lower CO2 emissions. Please read it carefully before flinging-off random accusations and false statements. Chris you are wrong AGAIN and it is you that should read more carefully. The RS report states that there wouldn’t be any change for thousands of years even if co2 emissions were stopped today. But we all know that isn’t the case because the EIA expects emissions to increase by 34% by 2040. Simple maths and very simple logic and reason. What don’t you understand? Here it is AGAIN and BTW I’ll get back about question 5 later. Remember ozone depletion? As I said, this was false. Maybe you should just retract your claim. You are now talking about everything else as a distraction. This is an annoying habit. Of course, if CO2 emissions, cease, decline or just level off – it will take a long time for temperatures to fall. Look I’m not going to waste time arguing any more about the RS report. I’ve given my explanation and it is clear in any possible PRACTICAL scenario it will take many thousands of years to reduce co2 levels and temps. Of course that’s according to the RS report. Remember we’re trying to reduce co2 levels from 450 to 560 ppm in the future, not the 280 ppm level that lagged temp reduction coming out of previous IGs. This large future co2 level comparison ( back then high of 290 ppm ,now much higher) obviously further supports my claims. But I can easily support my arguments by referring to numerous PR studies from many earlier intergacials/glacial periods over many hundreds of thousands of years. 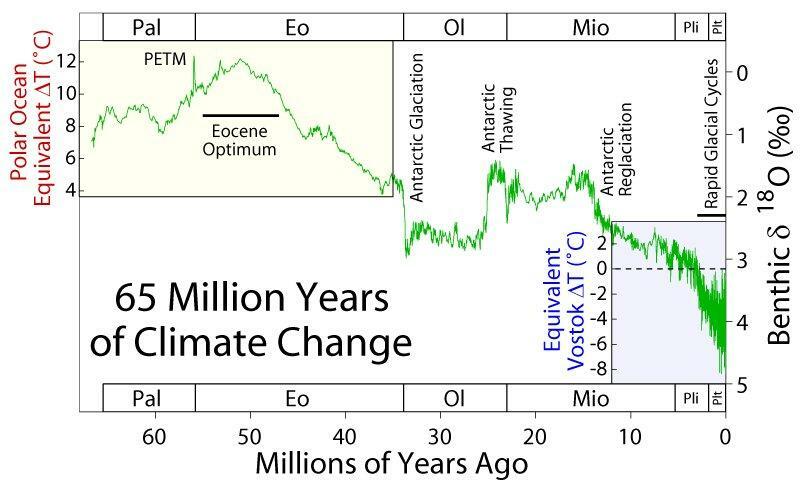 Ice core and other studies clearly show that the Holocene is the coolest and most stable IG over the past 450,000 years. Over that long time frame co2 levels have never risen above 290ppm and yet have sometimes lagged temp rise and fall by many thousands of years. Again there is nothing unprecedented or unusual about temp during our more stable and cooler Holocene at all. See this summary from Co2 Science using the best ice core studies. And further summary of many more PR ice core studies at this link. Good call. That hole was starting to get deep. Geeeezzzzz JR what a crushing reply. Read what I’ve said above AGAIN , it makes sense and if you like I can find more PR studies that support my case. But then again you don’t seem to base a lot of your comments on data and PR studies. Certainly logic and reason don’t seem to feature strongly in any of your comments. I’ve been waiting for some left wing donkey to attribute future coal use to more tropical cyclones. Right on cue up steps the Greens Adam Bandt who actually believes OZ can increase the number of cyclones if we build a new coal fired power station. And people voted for this fool? What an embarrassment for OZ education and simple logic and reason. This dumbo also thinks that our PM would have blood on his hands, when the data shows that deaths from extreme weather events have dropped by 97% since the 1920s. In fact the last super cyclone hit the Qld coast over 200 years ago and we’ve been very fortunate ( so far) that we haven’t seen one of these monsters since that time. But super cyclones were certainly a feature of OZ weather over the last 6,000 years. And co2 levels then were about 280 ppm. Greens MP Adam Bandt is an exploitative fear-monger. If Malcolm Turnbull uses scarce public money to build a new coal-fired power station he’ll have blood on his hands. Because the more coal we burn, the more extreme weather events like Cyclone Debbie or Cyclone Yasi we will see. In fact, the Bureau of Meteorology show a dramatic fall in the number of cyclones in Australia in the period of alleged man-made warming. In summary, confidence in large scale changes in the intensity of extreme extratropical cyclones since 1900 is low…. Over periods of a century or more, evidence suggests slight decreases in the frequency of tropical cyclones making landfall in the North Atlantic and the South Pacific, once uncertainties in observing methods have been considered. Little evidence exists of any longer-term trend in other ocean basins… Several studies suggest an increase in intensity, but data sampling issues hamper these assessments… Callaghan and Power (2011) find a statistically significant decrease in Eastern Australia land-falling tropical cyclones since the late 19th century although including 2010/2011 season data this trend becomes non-significant (i.e., a trend of zero lies just inside the 90% confidence interval). You need to maintain some sense of decorum. It is unsafe for you to label others as donkey’s when it is clear this applies most appropriately to you. The SA Labor govt didn’t even have the brains to keep reliable coal power going and turned down a tiny cost that has cost them and the state a lot of expense. Incredible to think that people keep voting for these clueless fools and Vic Labor hasn’t learned the lesson. The Labor blind leading the blind. And next we have the mad Shorten Labor opposition who’ll also waste endless billions on the same idiotic disaster. Of course no measurable difference to temp or co2 levels by 2100 at all. The AEMO now blames clueless wind energy for the SA blackouts. Here is Andrew Bolt’s editorial focusing on the lies and distortions of the Greens (and SA Labor’s Weatherill) over the last 10 years. How refreshing it is to see our best Aussie journalist tell the truth and provide facts and proper data to back up his claims. So why is the rest of our media so ignorant and so hopelessly biased about their so called CAGW? Let’s hope the Liberals go after Weatherill and the latest revelations behind the SA blackouts. Was he offered a cheap reliable solution for future coal fired power or not? Surely the poor SA taxpayers deserve to be told the truth? You have to laugh at the problems and corruption now developing in the EU. Here’s the link and a summary from The Guardian. Amazing that German co2 emissions have been rising while the US emissions have seen the biggest fall of any country on the planet. And they’ve fallen because of an increased use of gas. A useful lesson for the stupid CAGW fanatics. And the barking mad OZ Labor party are in a headlong rush to follow the EU example. We can only hope that the fra-dulent Paris COP 21 nonsense bites the dust sooner rather than later. Dr Hansen will be p[leased. Also there are many recent studies that show a fall or little change in Antarctic temps. So much for their enhanced CAGWarming trend at the poles. You do realise that these labels are not falling where you intend. The face at the bottom of the well is your own. Well Chris you could be right ,but I get very testy when I add up the never ending billions/trillions $ we and every country are spending on this mitigation fantasy. I’ve never been in any doubt that there is nothing we can do to mitigate their fantasy and Lomborg’s PR study supports my case. Also all the latest series of modelling studies show much lower sensitivity as time passes. We must use adaptation as the best defence against the worst that mother nature throws at us in the short and long term and ignore fools like Labor, Greens and other extremists like Steffen, Gore, Flannery etc. Anyway they’ve been hopeless up to now so why would anyone listen to their silly nonsense. And no measurable change for co2 levels and temp by 2100 and beyond . Well said, Neville. The world sure needs to hold its nerve against the silly bed-wetters like the blitherer. At the moment I am in the middle of exTC Debbie as are many others and I just shudder to think what it would be like if we were facing this with renewables. No solar for days, too much wind so no windmills. And think of the havoc that would be wreaked on those widely scattered installations. What a solution! So far, thanks to F/F we still have power. If the bleaters, bedwetters, botherers and blitherers weren’t so blind we could solve their imagined problem with gas and fission but then we would be too well off and their religion would never stand for it. They not only predict doom, they actually insist on it. SD I hope you and your family are okay. Amazing what power , destruction and flooding is the result of just one cyclone. But what you said was very true, if we were relying on idiocy like S&W it would be a very different scenario and many more people would have to suffer. Just incredible that Greens and Labor pollies just seem to WANT to be ignorant of the facts and can’t seem to understand the consequences of their actions. And many more billions $ washed away just to enhance the pain of the poor long suffering taxpayer. Amazing how much nonsense our lefty media tries to tell us on a weekly basis. I’ve heard a lot of BS lately that China is using more renewable power and that they are cutting back on coal. But here we have a new report that states that China’s imports of coal have jumped by 48.5% in Jan and Feb ( 42.6 million tonnes) this year. This just proves how our OZ media are treating us like fungus. IOW feeding us on plenty of BS and keeping us in the dark. You’ll note they claim that China’s nuclear and wind combined only generate 4.8% and solar less than 1%. But China’s TOTAL energy produced by fossil fuels is still 87.5%, while Geo-thermal S&W produce just 1.3% and Nuclear 1.1%. Incredible but true,what a joke. Here’s the latest EU’s IEA pie chart. Such points do not help us understand the problem. If Australians demand the right to drive cars and burn fuel to obtain a living standard the so do the Chinese, Indians, Africans, and South Americans. So what is your understanding of the need to rein in GHG’s or do you think they can increase forever? Perhaps you should start at the beginning and explain what you see as ‘the problem’, and then why , on what basis, you see it as a problem. Don I pursued the famous Luke at Jennifer’s blog for years trying to get him to tell us how to fix his so called problem and at long last he admitted it was too hard. Chris, perhaps you’re starting to wake up, we can only hope. Here’s your problem. 1. Yes Chris the developing countries want to have reliable energy and a higher standard of living. These people are not stupid. Not many Weatherills, Gores, Shortens, Bandts Merkels, Andrews, Manns etc to be found among them. Although to be fair these named con merchants certainly know how to enrich themselves and look after number one. BIG TIME. 2. Most of the increases in co2 emissions come from these developing countries and have done so for many years. 3. Germany’s co2 emissions actually increased last year. So just shows the type of stupid mess we’ll be heading for if we vote for Labor and the Greens next election. 4. US co2 emissions have fallen by a substantial % because of the use of fracked gas over the last few years. The US reduction is the highest over the last 5 years by a wide margin. 5. The hypocrisy from clueless Labor is just mind boggling. The QLD Premier has just returned from a business trip to India begging the Indian company and govt to please go ahead with the opening of one of the largest coal mines in the world. Yet next in a bi-polar moment QLD Labor actually wants to inflict a much higher percentage of fairytale, unreliable S&W on their own people. Tell us how this makes any sense Chris? 6. You do understand your maths problem don’t you Chris? OZ only emits 1.2% of global emissions, yet Labor has just blown up CF power in SA and have just closed down the safest and most reliable CFired Stn in Vic. At the cost of over 700 jobs, so AGAIN please tell us how this makes any sense? 7. We must use adaptation and more R&D to meet any future challenges and in the meantime we should build more cheap CF stns as the need arises. Just plain common sense and no measurable difference to temp or co2 emissions by 2100 and beyond. 8. Don’t forget Lomborg’s PR study about Paris COP 21 uses a much higher sensitivity than the recent modelling is showing. So even more reason to spend our now borrowed money on number 7 above. And Lomborg’s big think tank has some of the best stats, maths and economic experts to back up his PR studies. Four REAL Nobel Laureates at last count. Chris do you disagree about the points above and if so please tell us how to fix your so called problem? And remember even Dr Hansen the father of CAGW knows that COP 21 is just BS and fra-d. Sounds more like a party political broadcast. In both cases those generators were not state owned (sold by Liberal govts. in both cases) when their owners decided to demolish them. The decision to shut Hazelwood was made in Paris. I notice The Australian is now running a line that the current SA govt. could have kept their coal fired power station open if they’d just payed a ransom to the owners, so the new privatisation model seems to be sell it, and then pay them annual ransoms to keep it open. I thought the conservatives were all against the state bailing out the private sector (Holden, Ford, Toyota etc.)? Go for it. Nobody is stopping you, there’s no carbon tax, and coal is cheap. Think through the logistics of that investment and you’ll work out why the private sector doesn’t want a bar of building generators in Australia. Or when you say “we” do you mean the government? Conservatives really need to work out whether they think electricity generation should be done by government or the private sector… they seem to bounce around all over the place on that. Meanwhile, it’s the private sector that is screaming out for an emissions intensity scheme. They’re not going to spend a penny until there’s at least a hint of certainty over the expected lifetime of the asset. The French company closed HW because the Andrews’ govt substantially jacked up the royalties they had to pay. S&W only becomes viable because of huge subsidies from the poor taxpayer and we should scrap all the RET nonsense etc ASAP. If all subsidies to S&W were scrapped we could have new cheap, reliable CFired power available within a couple of years. Then we would be able to create new businesses and jobs. Oh and the 30 million $ deal that the company offered SA was a dream deal made in heaven but Weatherill and his layabouts were too stupid to catch on. You do realise how much their S&W fiasco has cost the state and its taxpayers don’t you. You need not worry, dear readers. This fearless correspondent will continue to wage war on this issue even when all my comrades have surrendered. It is becoming increasingly difficult to remain a hard-core supporter of climate change belief. The entry into the debate this week of zany zealot Adam Bandt was horribly wrong on several fronts. He [Bandt] made the staggering claim that Malcolm Turnbull would have “blood on his hands” if he supported the building of coal-fired power stations, exclaiming that these stations would cause even more cyclones to hit the coast.